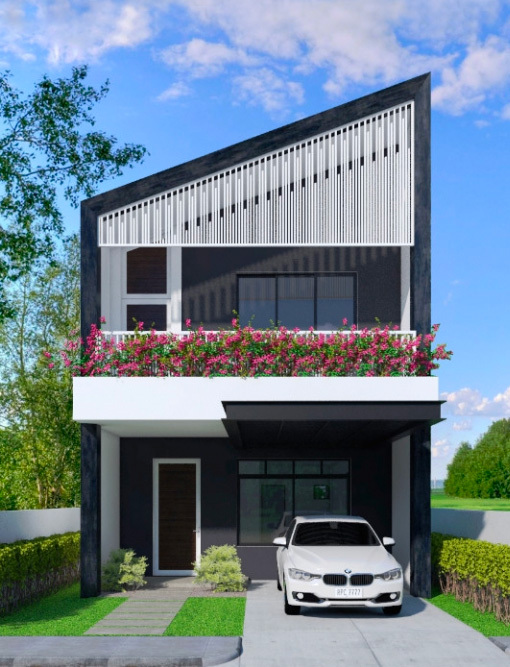 Two modern home designs - each with a colourful twist in the tail. 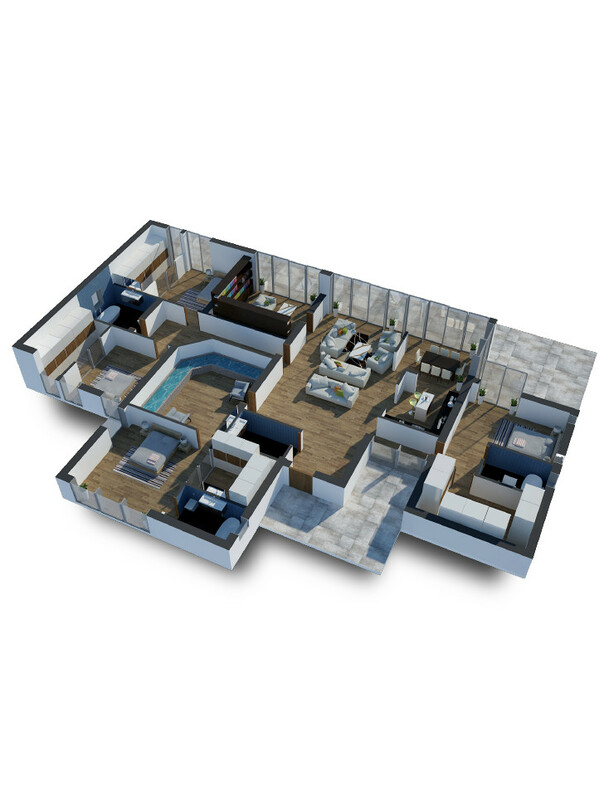 Take a tour of each and see which colour family draws you in the most… Will it be a powdery palette of pale grey and pastel hues that are offset with broad black borders, or will it be a grounded grey, black and wood tone scheme that breaks out glorious sunshine yellow accents in the bedrooms? 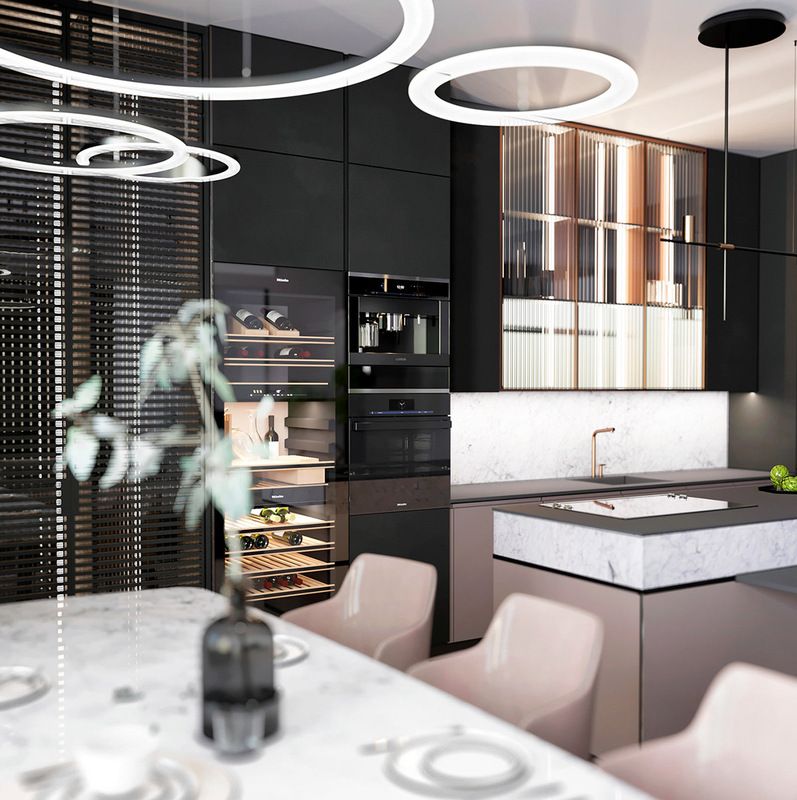 Whichever of these two gorgeous interiors look the most like your happy place, you are sure to appreciate the sleek bespoke storage cabinets that are fitted throughout these contemporary homes, the chic furniture designs and the gorgeous home lighting that illuminates the whole show. 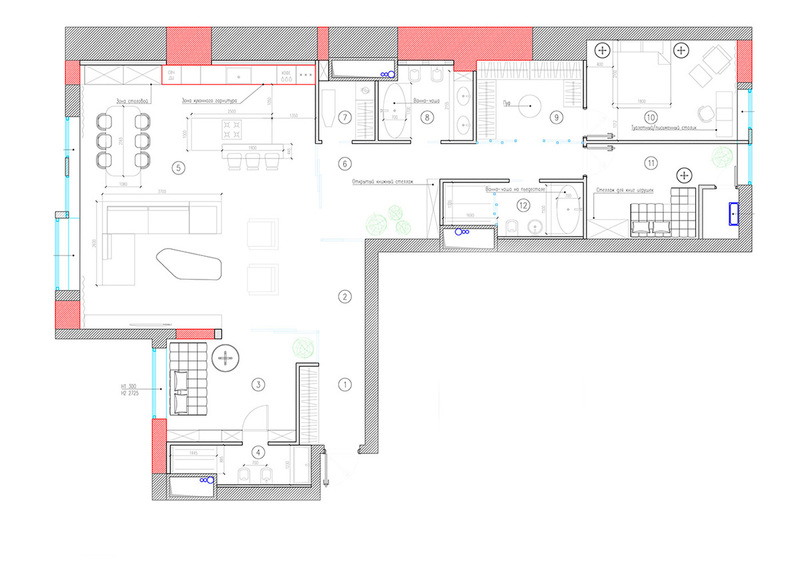 A decidedly mauve hue colours our first home interior, over an open plan modern living room layout. 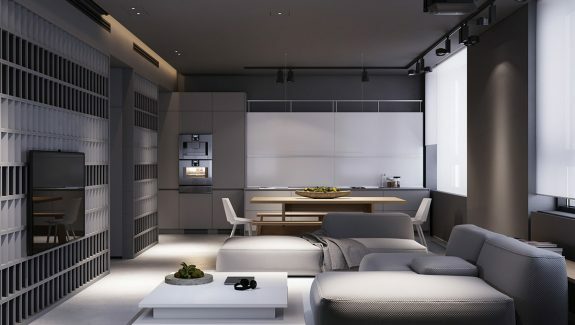 Black kitchen cabinets and black integrated appliances across the back wall help to weigh down the powdery decor. 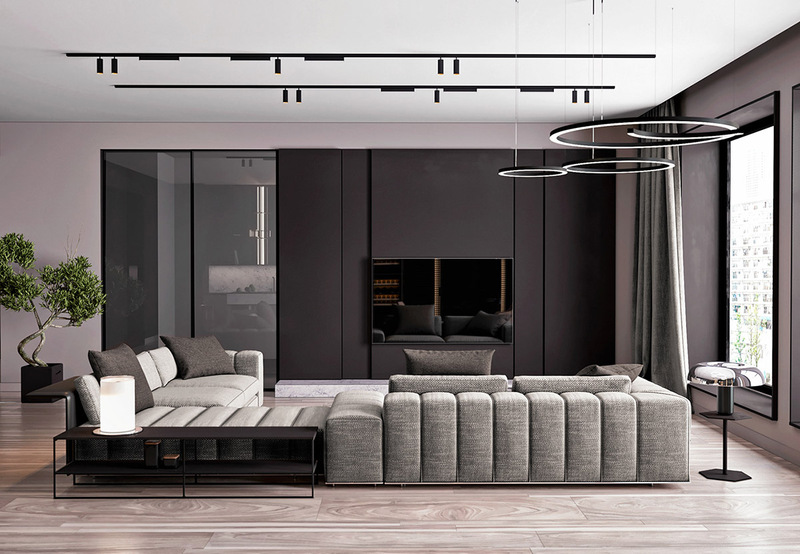 In the foreground, mid-grey sectional sofas and a matching upholstered bench equal the tone of the walls. 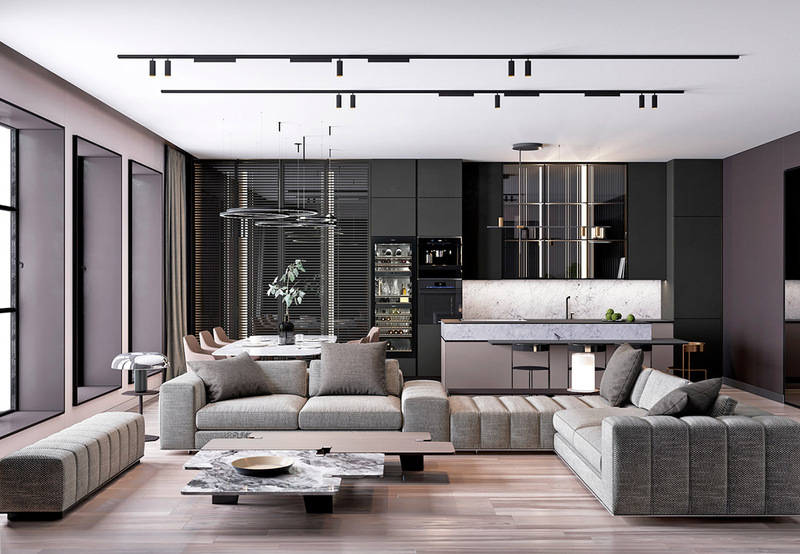 A sofa table runs along the back of the seating, and a small side table serves the other end with a designer table lamp. 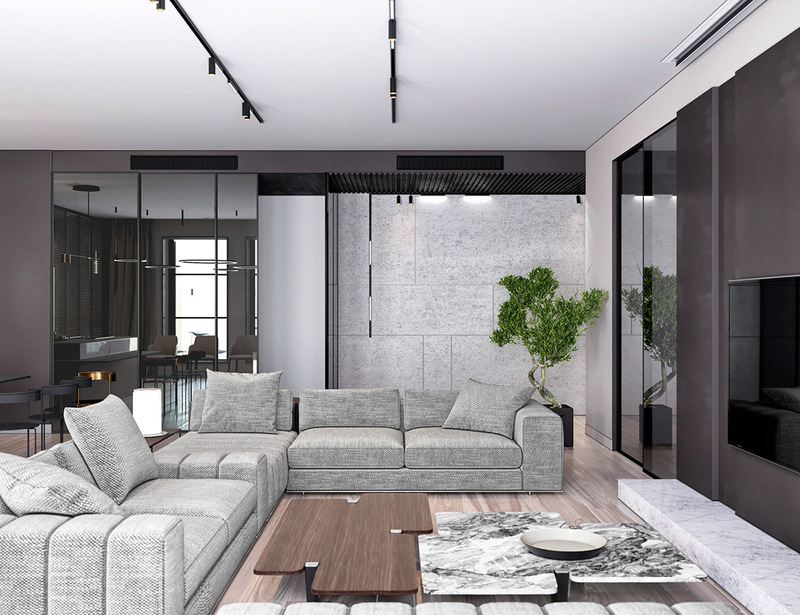 The modern sofa arrangement surrounds a unique coffee table set, which has interlocking marble and wood effect pieces. 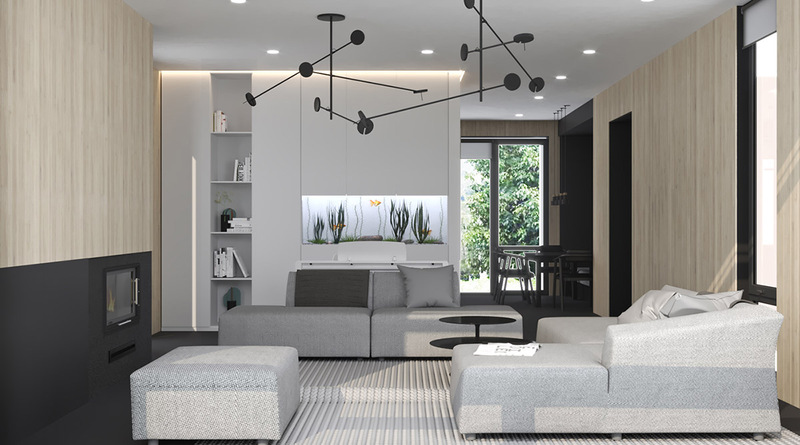 A large indoor plant creates a decorative twist at one side of the lounge layout, next to a set of glass doors that meld with the tv wall decor. Pink dining chairs run the length of a white dining room table. The pastel chairs match with pink base cabinets in the neighbouring kitchen. A gold faucet and gold trims on some glass wall cabinets compliment their blush hue. A gold stool joins three black kitchen bar stools in the pink kitchen too. 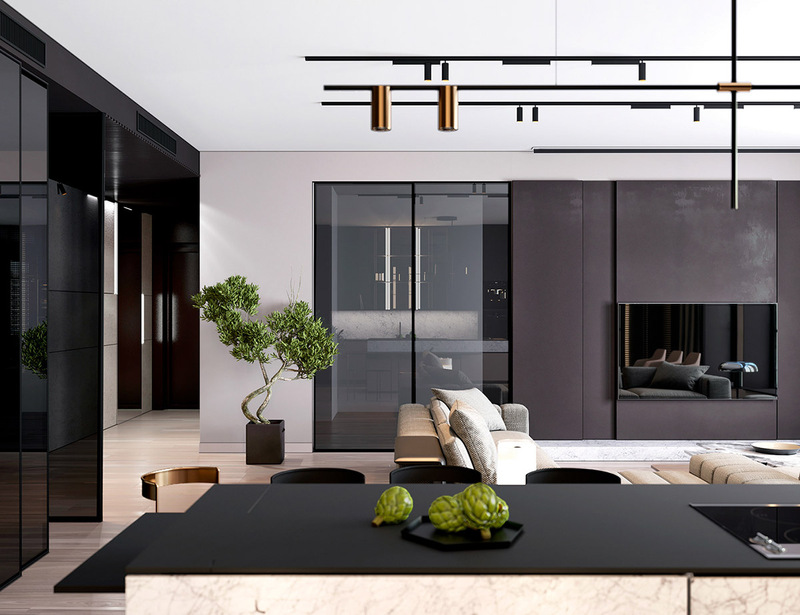 A black and gold kitchen pendant light pulls the two finishes together. 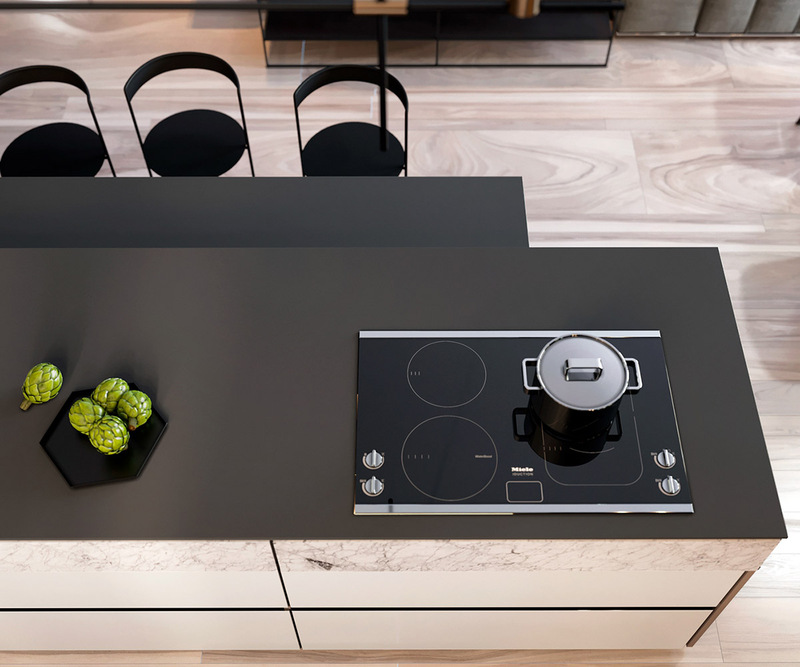 The kitchen island is equipped with an electric hob. Just off the lounge, there is a dedicated home office. A couch is set at one side of the study as a comfortable reading spot. A black shelving unit skims the armrest. 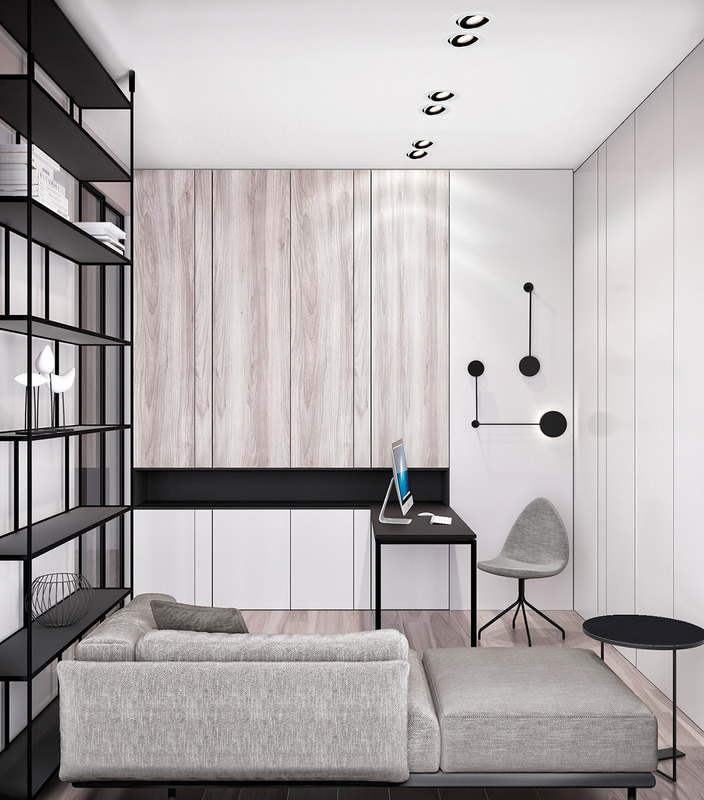 The desk extends directly out of a bespoke cabinet installation in the modern home office. 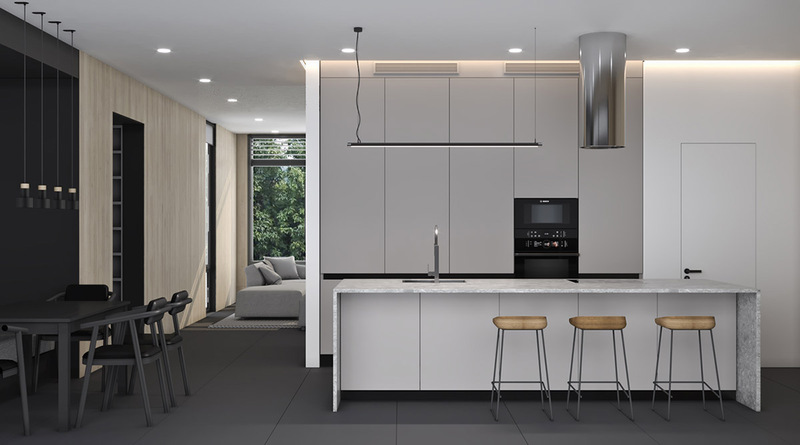 The upper units are finished in light wood tone whilst the base cabinets are coated crisp white. 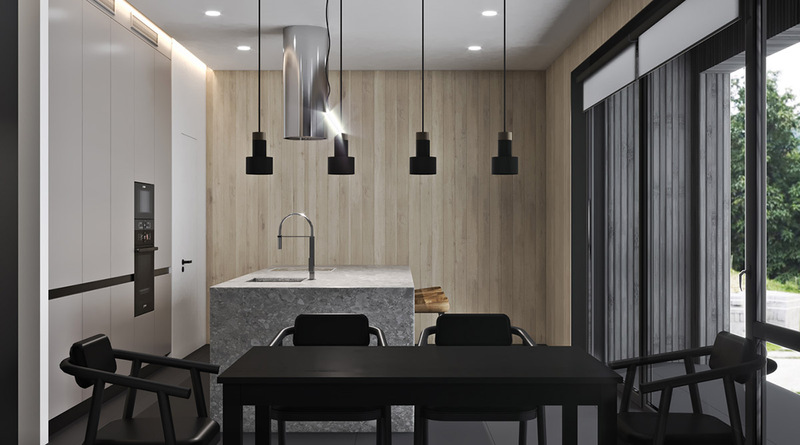 A stark black display shelf cuts through the cabinets at desktop level. 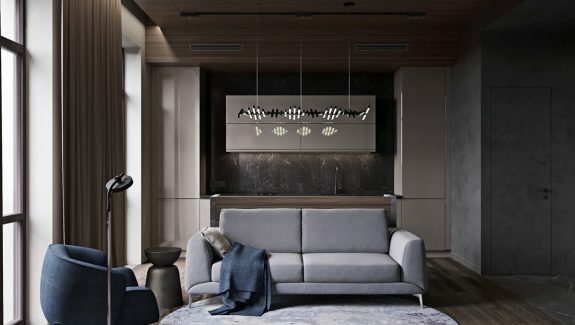 A wall sconce looks like a piece of modern art over a Drop chair, which comes in a grey fabric that matches the adjacent sofa. 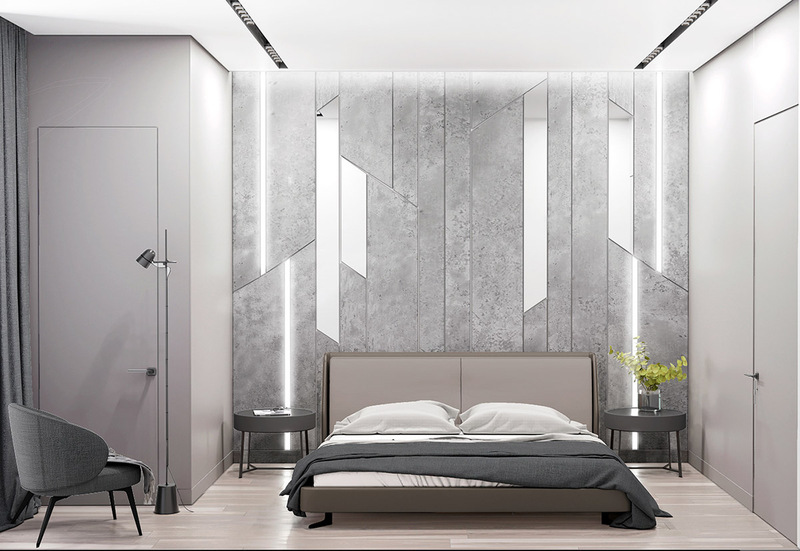 A unique headboard feature wall creates a very modern bedroom scheme. 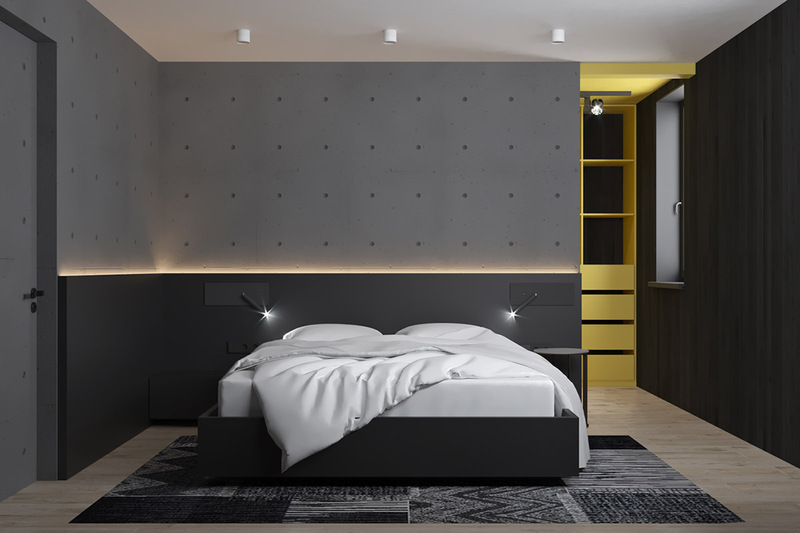 LED strips are recessed into the wall to light the bedsides. 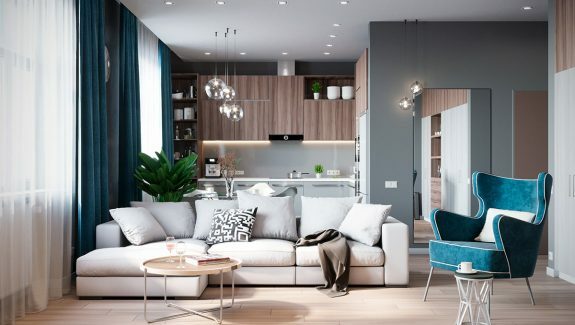 A grey bedroom chair has been set beside a neat floor lamp as a reading area. 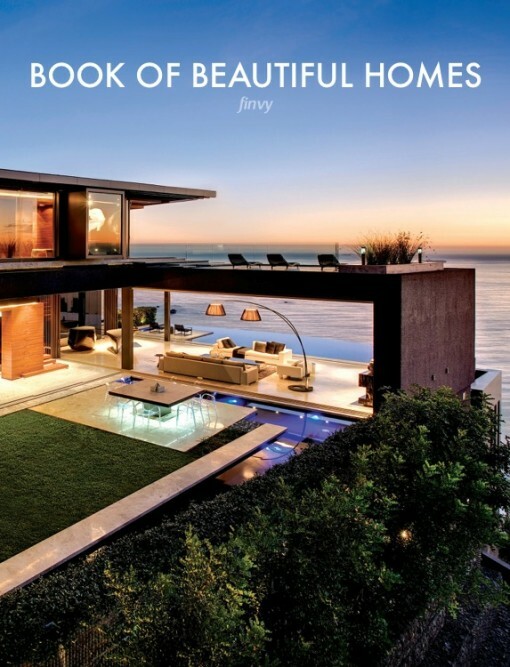 You can find more floor reading lamps here. 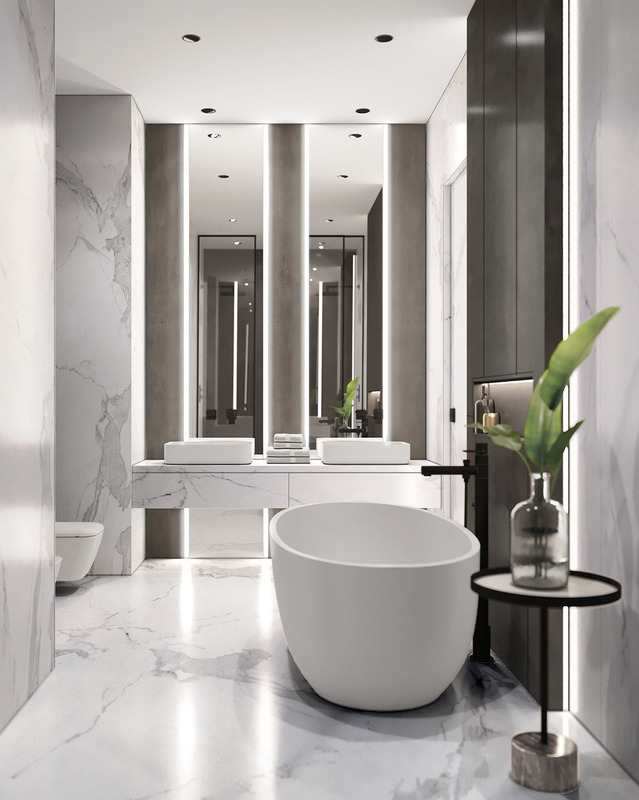 Walls, door and floor covered in white marble effect makes for a luxury bathroom scheme. A darker feature wall, lit with LED perimeter lights, makes the bathtub the star of the show. 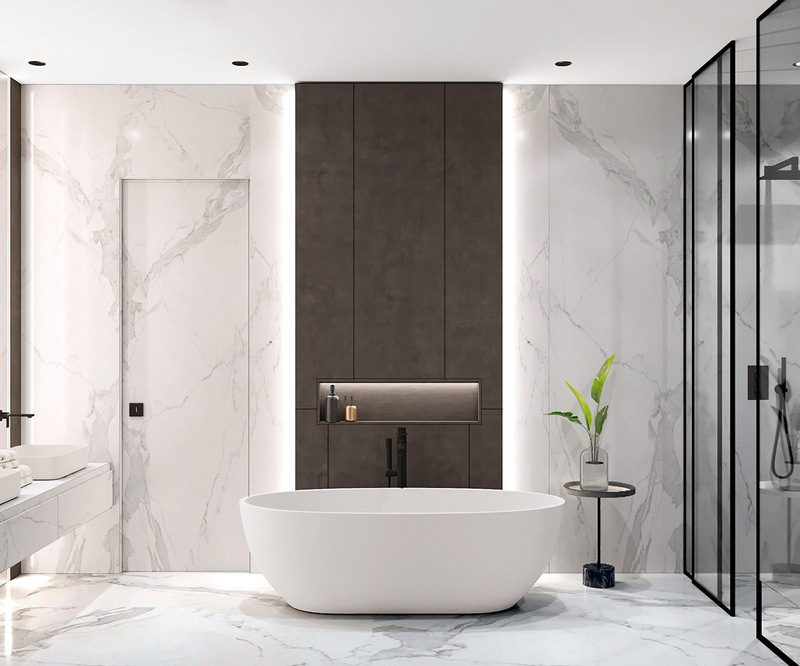 The beautiful bathtub is accessorised with a black freestanding faucet and a black side table. 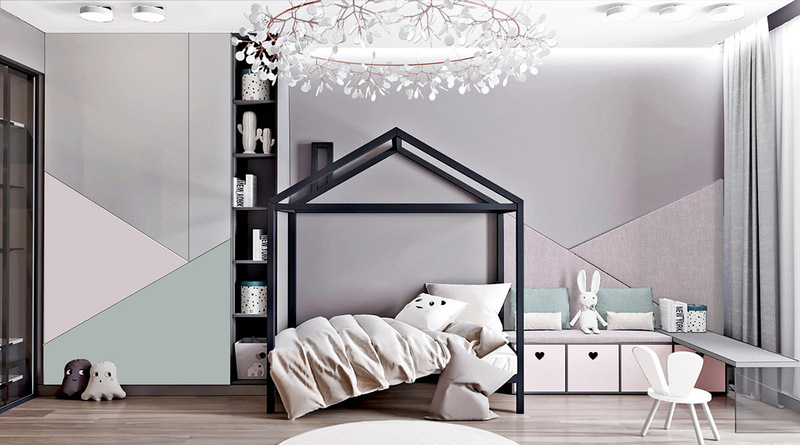 A black house shaped kids’ bed stands out from a pastel backdrop. 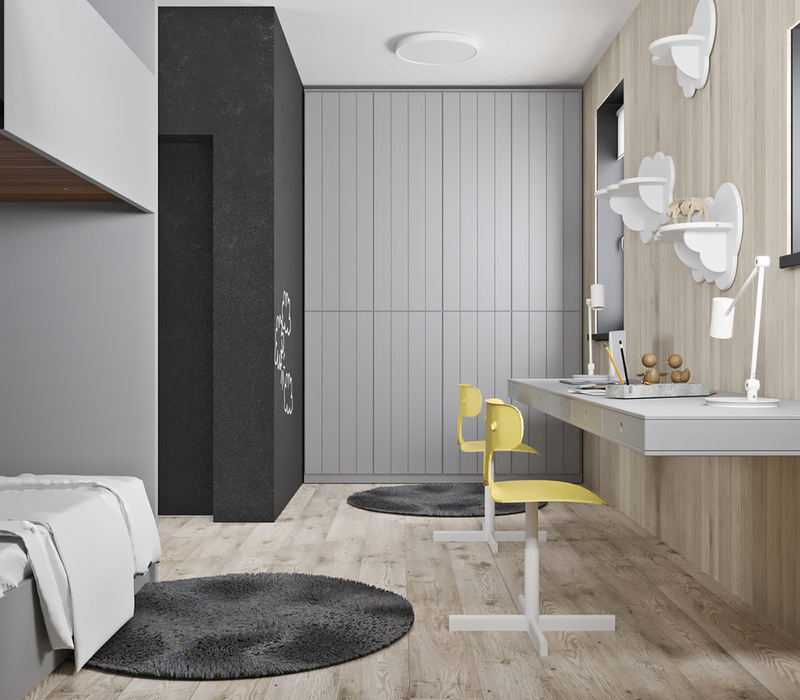 The ensuite is a neat grey and white bathroom scheme. 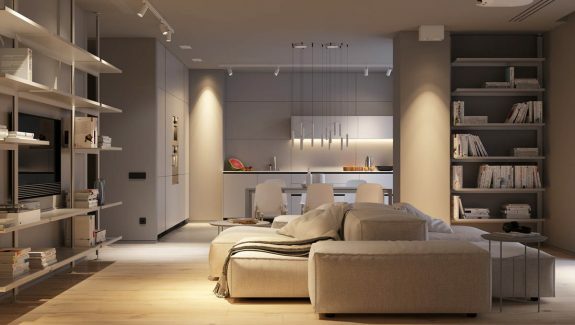 Our second home tour starts with a minimalist living room. 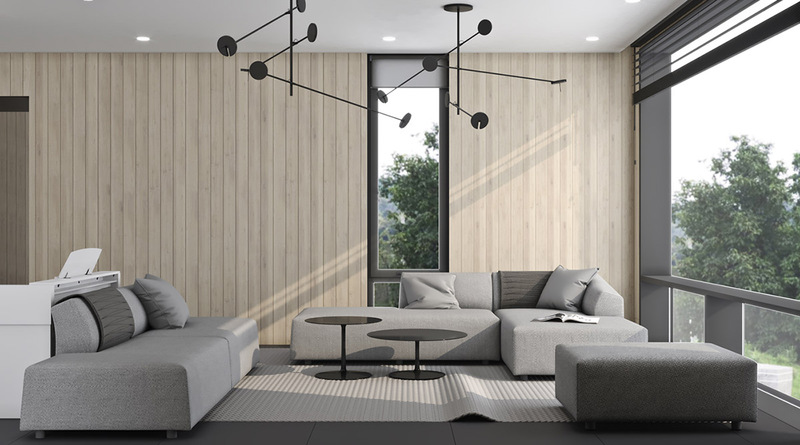 Grey modular sofas and black nesting coffee tables are set against light wood panelled walls. A modern wood burning stove is set into the chimney breast. A narrow bank of log storage has been created just around the corner. 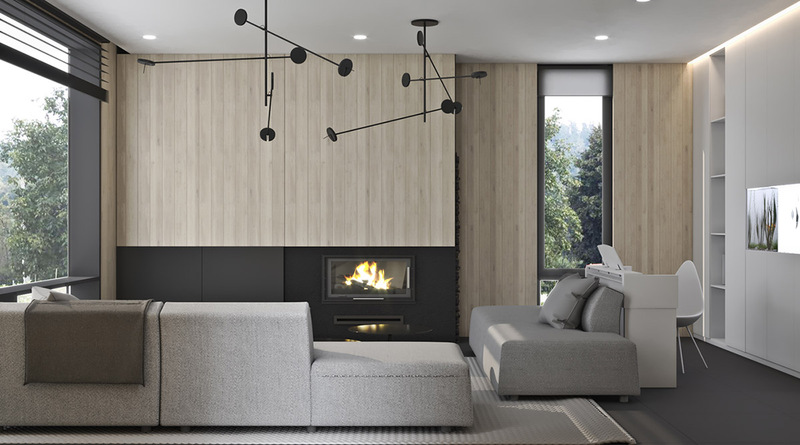 Two modern pendant lights span the ceiling space. 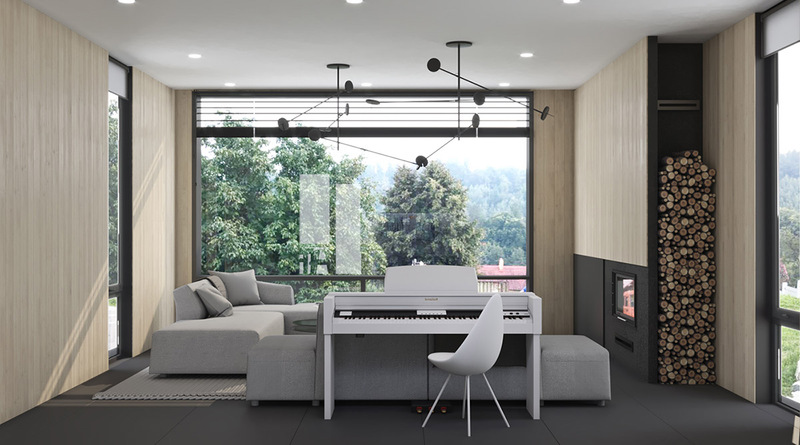 Behind one of the sofas, a Drop chair sits poised at a piano with perfect views over a peaceful landscape. 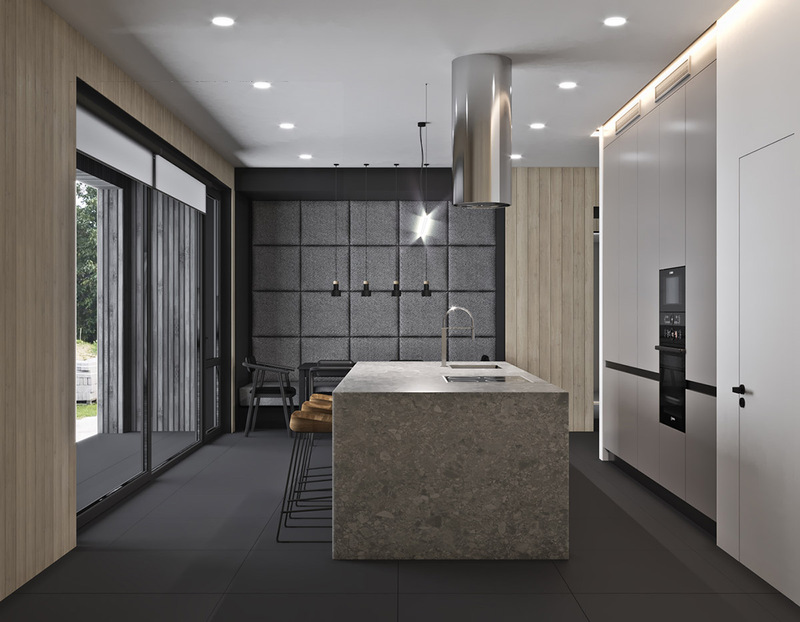 The kitchen plays host to a very black dining set and solid black dining room pendant lights. 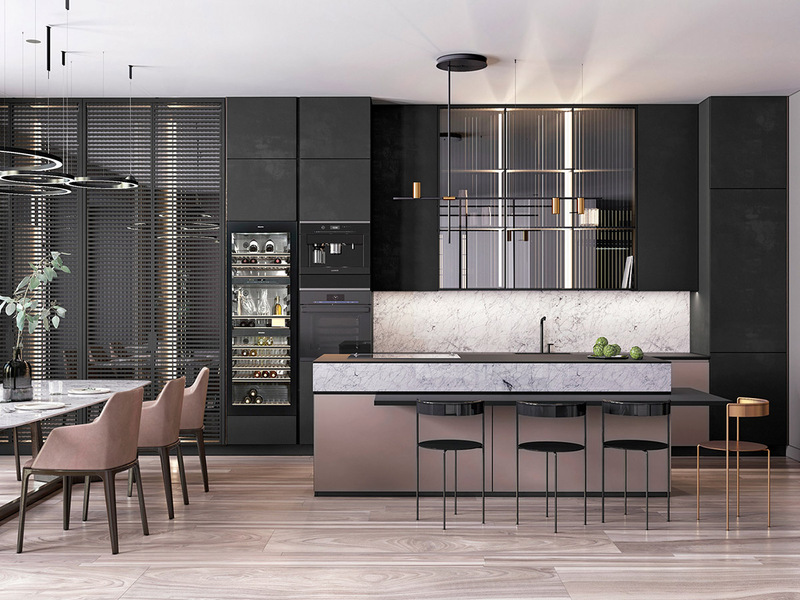 Light cabinets and a pale granite wrapped island make the kitchen side of the room a brighter affair. 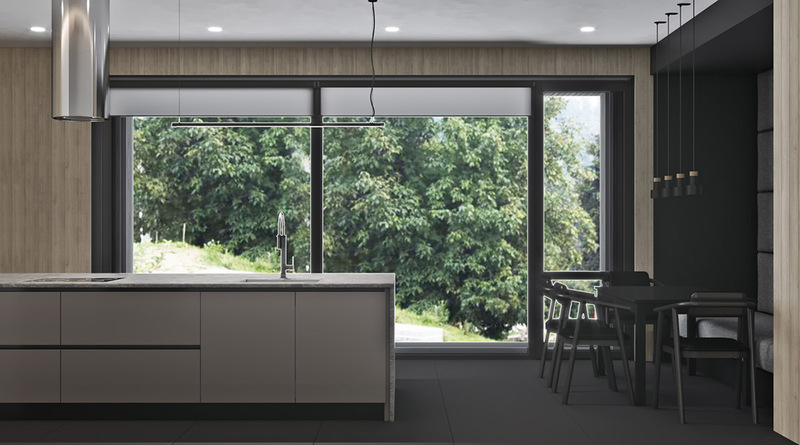 A simple linear pendant light illuminates the central kitchen island, so as not to disturb the glorious garden view through patio doors. Three wooden kitchen bar stools add a more casual eating spot to the kitchen diner. 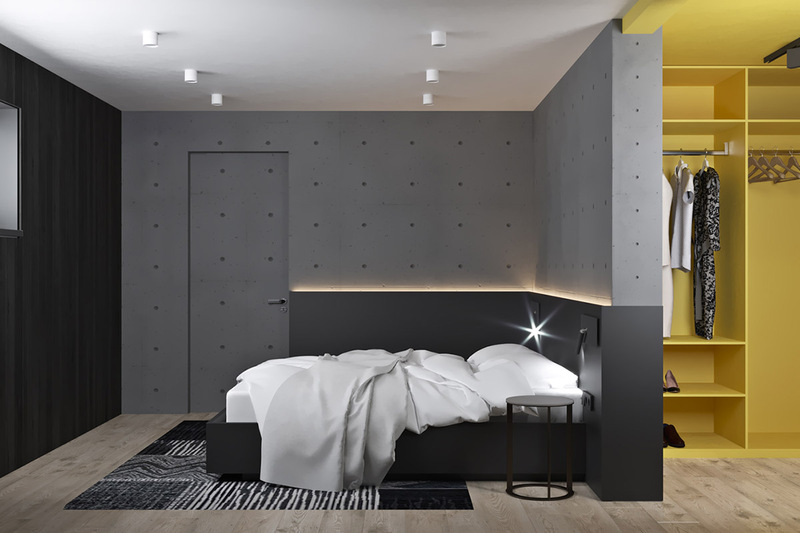 Moving away from the neutral main living areas, the concrete finish bedroom has a bright surprise in store. 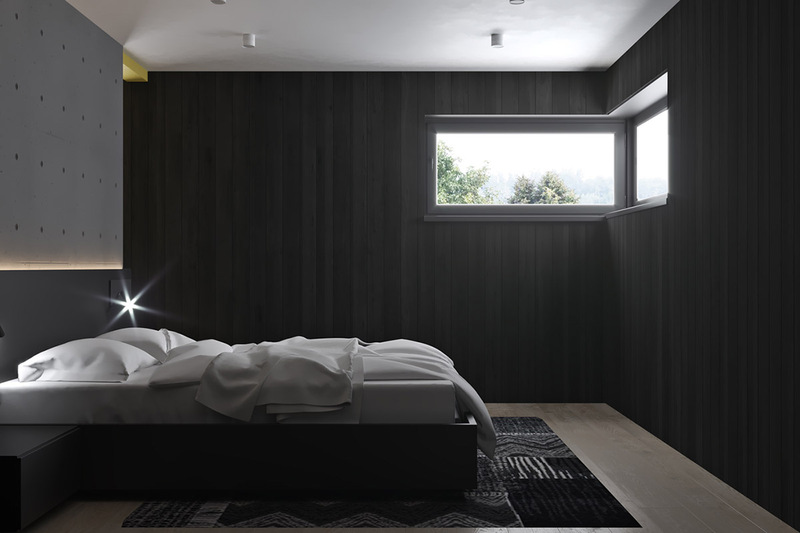 A yellow walk-in closet yells for attention at the back of the grey and black bedroom. However, with the loud yellow closet out of line of sight, the sleep space is a dark and peaceful zone. A high window peeps out to the dawn or the stars. 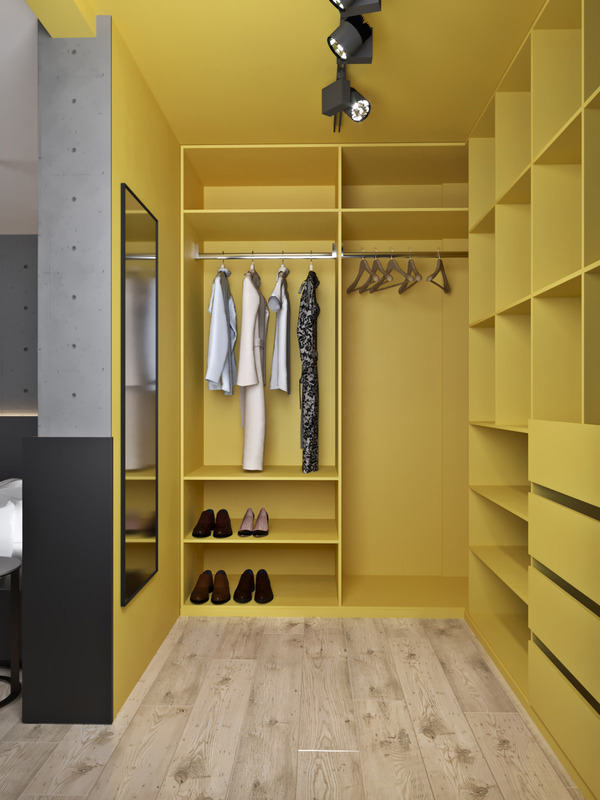 A bright yellow closet makes for an energised early morning wake up! 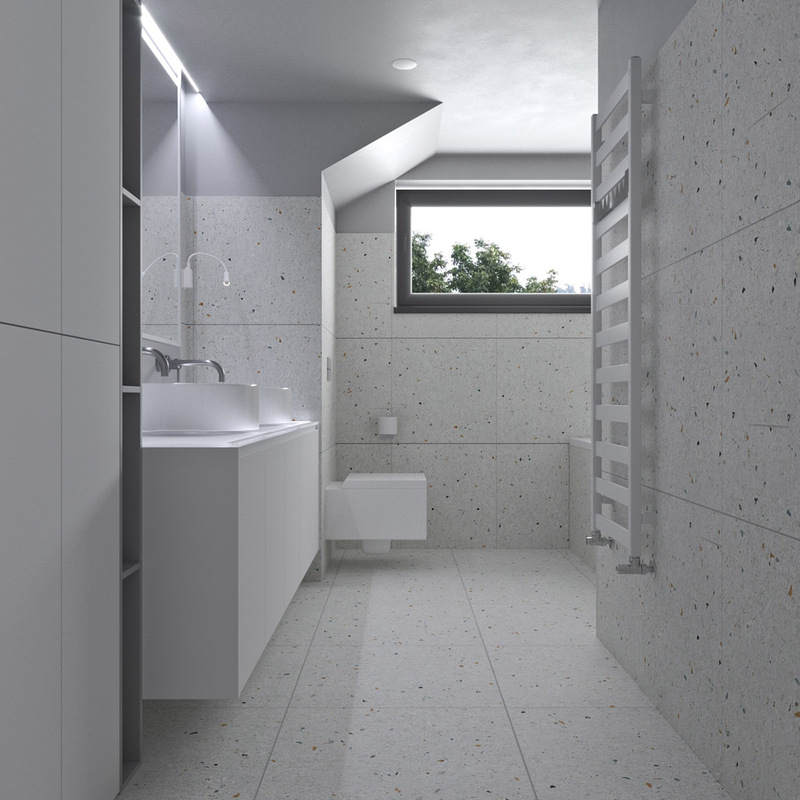 The bathroom is a crisp white scene, crowned with a pale grey ceiling section. 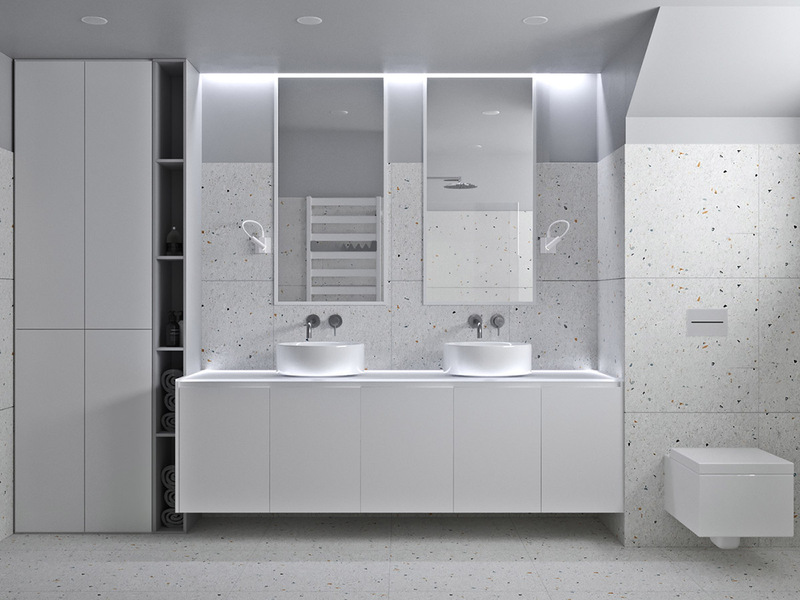 A generous double sink bathroom vanity dominates one wall of the white bathroom, beneath two vanity mirrors. 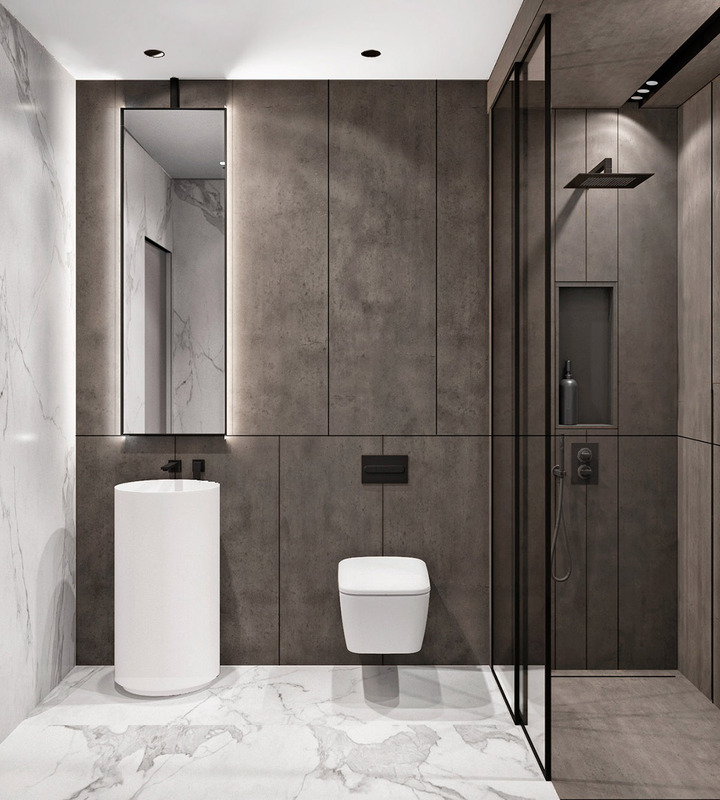 Tall bathroom cabinets offer even more concealed storage space at one end of the vanity unit, as well as some narrow open shelving for frequently used products, fragrances and rolled towels. 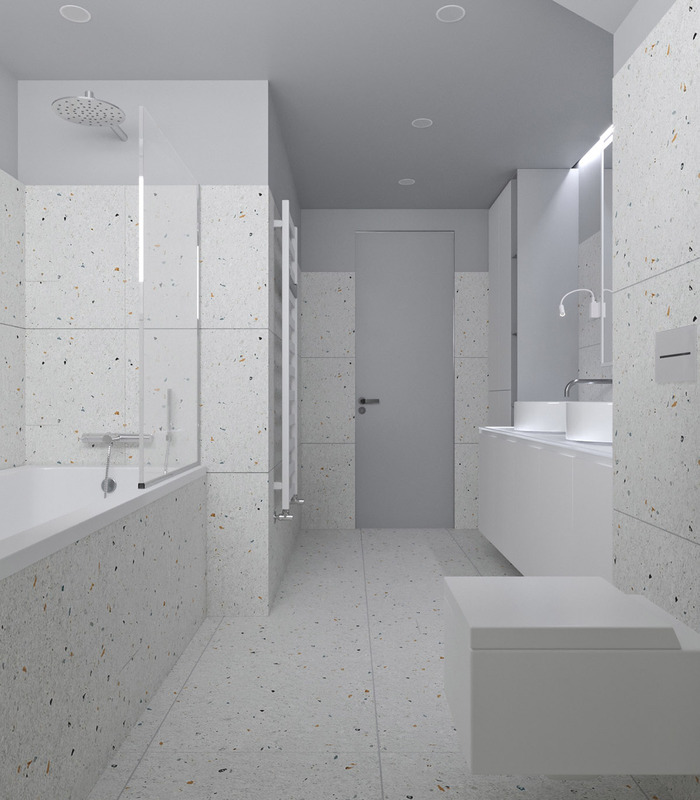 The white tiles are flecked with yellow to bring in a hint of the bedroom accent. 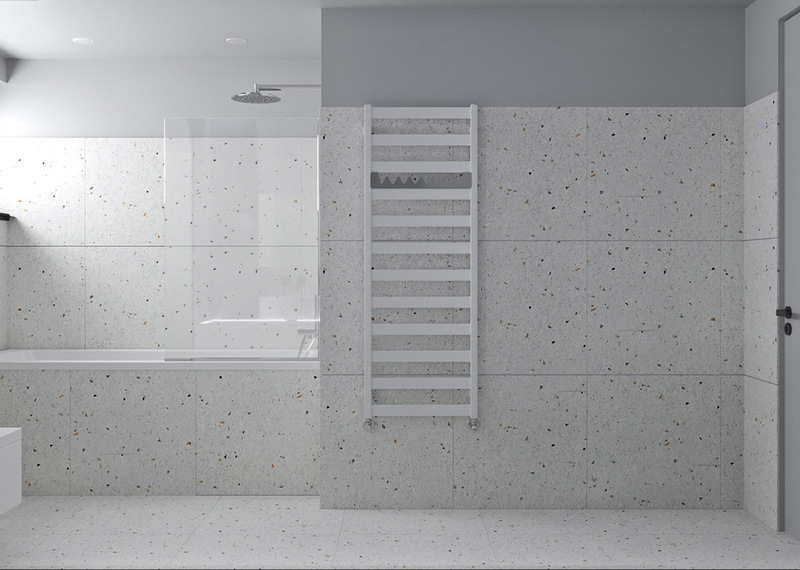 A simple white heated towel rail makes use of a long wall. The thread of yellow continues into a shared kids’ room with a double study area. 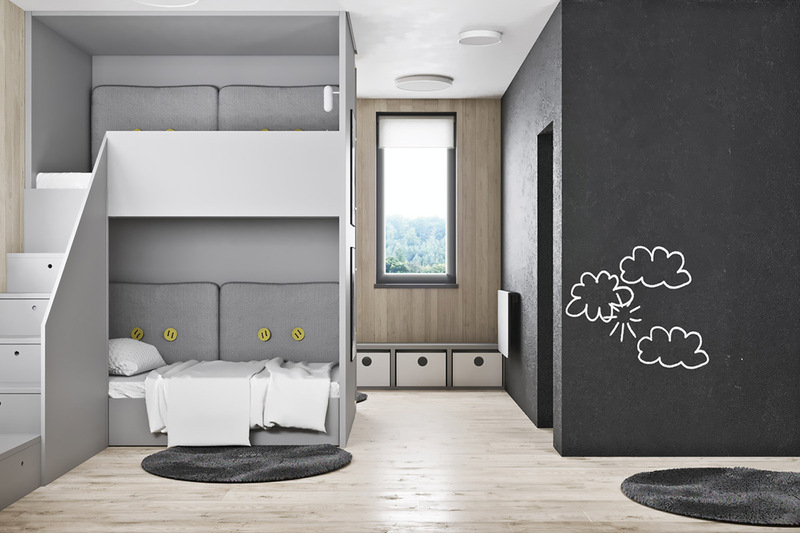 A bespoke bunk bed design stands in the centre of the floor, acting as a room divider to section off a third sleep space on its other side. Two yellow desk chairs brighten the kid’s study zone. 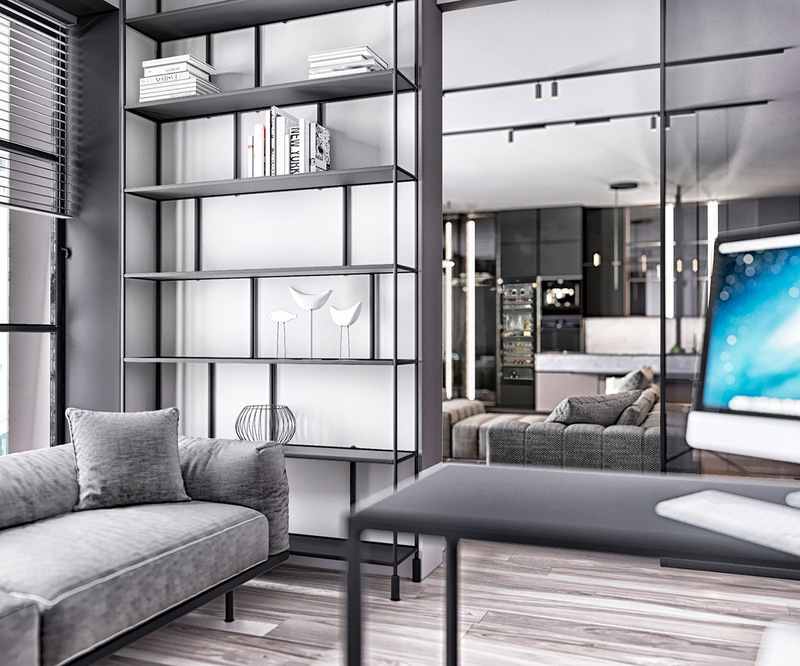 The double workspace is wall mounted for a clean look that also maximises floor space. 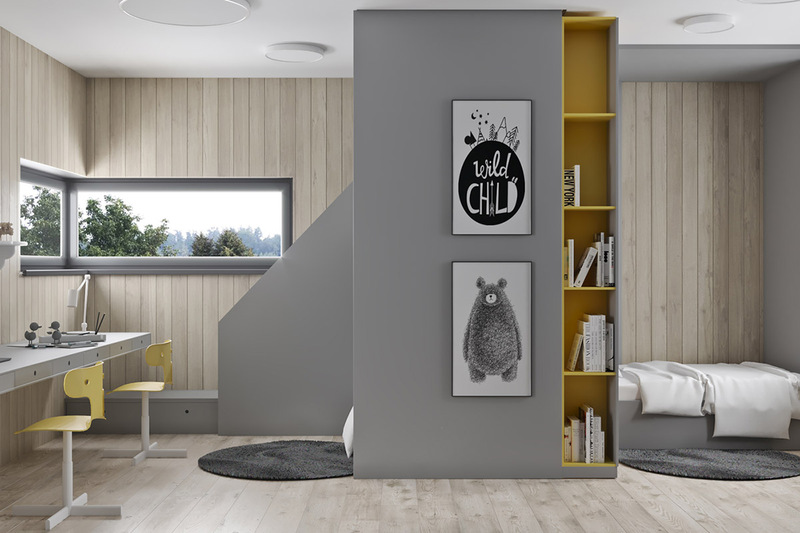 A yellow bookcase flanks the third bed in the room, brightening a grey wall of storage.